Metal spiral staircases can add a touch modern elegance both to interior and exterior spaces. They are ideal for small loft apartments where space is at a premium. Outdoor spaces can benefit as well – either in instances where a conventional staircase is too cumbersome or in instances where spiral stairs are simply better suited to your aesthetic tastes. Spiral staircases were originally designed for use in compact spaces. Examples can be found throughout Europe in medieval castles in which they were built to give right handed swordsmen defending the castle a tactical advantage over right handed soldiers attacking the castle. While today’s applications are not quite so dramatic, they can still be a welcome feature for your personal castle. The saving of space is a major reason that many people choose this type of stairs. Other advantages are that spirals are easier to build and install than conventional straight stairs – which means you can save time and money. Metal’s advantage over wood is in its durability. These stairs are meant to withstand a lot and won’t have to be replaced as often as wood stairs. 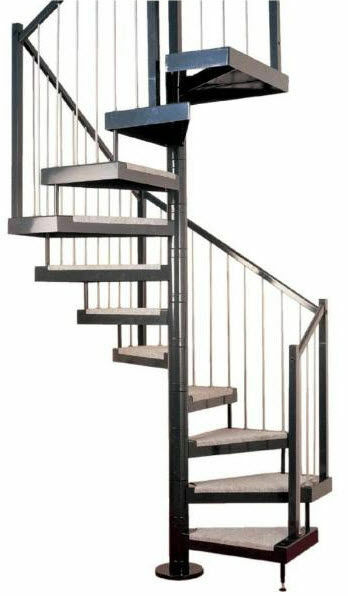 Our popular standard metal spiral staircases are available in six different diameters. Each kit includes a platform and 10 steps (11 risers) with the option to order additional treads in order to accommodate any height. Our measurement calculator can help you to determine exactly what you’ll need to order. A question that we are often asked is whether our stair kits will meet building code materials in their area. While the stairs themselves are built to comply with most local codes, there may be special requirements that you’ll have to meet when installing them in your area. It is recommended that you consult with a local building inspector to determine this. Additional spindles and larger center posts may be ordered to help you comply with your local codes. Tread options – While our basic kit comes with flat metal treads, you may also opt for treads with a checkerplate (recommended especially for outdoor and industrial use) or if you prefer the look of wood treads, you may add wood covers (oak, pine or cedar). Spindle options – In our basic kit models, there is one spindle per step. Intermediate spindles may be order to give you up to three spindles per step or you may opt to choose from a variety of decorative spindles. Other options – there are many other ways to customize you staircase to your unique tastes and décor choices. These include end caps for the outside part of the step, custom landings in your choice of shape, additional railings, wood or metal handrails and well as upgrades to larger center posts. To determine what stair kit and options are best for you, use our online tools or give us a call for a consultation.